↑ Boyne, Walter J. (2011). 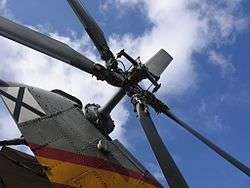 How the Helicopter Changed Modern Warfare. Pelican Publishing. p. 45. ISBN 1-58980-700-6. ↑ Rotorcraft Flying Handbook (PDF). U.S. Government Printing Office, Washington D.C.: U.S. Federal Aviation Administration. 2000. pp. 1–2 and 5–3. ISBN 1-56027-404-2. FAA-8083-21.